This impressive dessert is the perfect combination of rich coffee and nutty, light meringues. An ideal way to end a special lunch or dinner party. In a large bowl, whisk the egg whites until they form stiff peaks. Add 1 tbsp of the sugar and whisk again, then gradually add the rest of the sugar, whisking, until you have a stiff, glossy meringue. Fold through the ground hazelnuts, being careful not to knock out too much of the air. Line a baking sheet with baking paper. Spoon on the meringue in 8 billowing piles, spaced well apart (each meringue should measure about 6cm across). With the back of a spoon, hollow out the centres to create a nest. Bake for 1-1½ hours or until the bases easily peel away from the baking paper. Remove from the oven and cool completely. Melt the chocolate in a heatproof bowl set over a pan of barely simmering water (don’t let the water touch the bowl). Remove and set aside to cool for 5 minutes. Dip a teaspoon into the melted chocolate, then drizzle it over the top of each meringue nest. Leave to set completely. For the coffee cream, heat the coffee and muscovado sugar in a small pan. Mix the coffee liqueur with the cornflour to make a paste, then add to the pan and bubble for a minute, stirring, to thicken. Remove and leave to cool completely. Peel the meringues away from the paper and place each on a plate. Softly whip the double cream, mascarpone and icing sugar in a large bowl. Fold this mixture into the cooled coffee mixture. 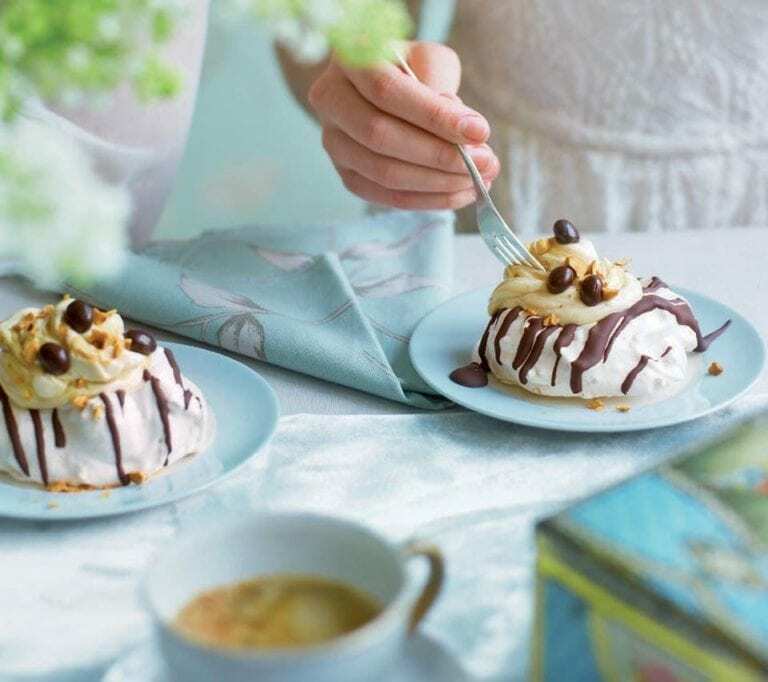 Spoon the coffee cream into the centre of each meringue nest and decorate with chopped hazelnuts and chocolate covered coffee beans or chocolate mini eggs. Make the meringues 1-2 days in advance. They will remain fresh stored in an airtight container.